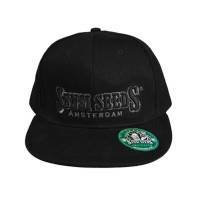 Flat Peak Cap by Sensi Seeds: the classic Sensi Seeds baseball caps have been a coveted accessory for years. But Sensi Seeds likes to move with the times and, with the introduction of the NEW Flat Peak Cap, acknowledges this new urban trend. The peak of the Flat Peak Cap does not curve like its baseball cap counterpart. The cap is also wider than the baseball cap, which would make bending the peak uncomfortable. Rather than the logo of the smoking lady, the Sensi Seeds name is featured on the front. For extra cachet, the name is embroidered onto the cap in a subtle relief, adding a stylish detail to an already very stylish cap. Available in black.